From fearful shame and sorrow to freedom on the heights. Here’s a tale that gives me hope when I feel down. In my first year at university, I joined a lunchtime Christian reading group where someone introduced a favourite book each week. We met works on finding God’s will, contemplative prayer, and other topics. One week someone recommended the Screwtape Letters by C. S. Lewis. I had loved his Narnia Chronicles as a child, but not realised he’d written much more. By the end of the year I’d also read The Great Divorce, and Lewis had conquered my imagination. In her journal on a trip to Switzerland, Hurnard described how joyfully a waterfall hurled itself down the cliffs, and observed that a chairlift resembles God’s promises. Its cable may look frail, but if by faith she overcame her fear of heights and got on, she was carried up the mountain by grace. Such insights give wings to Hinds’ Feet. This is the story of how Much-Afraid escaped from her Fearing relatives and went with the Shepherd to the High Places where “perfect love casteth out fear”. All the fairest beauties in the human soul, its greatest victories, and its most splendid achievements are always those which no one else knows anything about, or can only dimly guess at… Many a quiet, ordinary, and hidden life, unknown to the world, is a veritable garden in which Love’s flowers and fruits have come to such perfection that it is a place of delight where the King of Love Himself walks and rejoices with His friends. She notices that all running water bubbles the same glad song about the joy of self-giving as it leaps and splashes downhill. Much later, high in the mountains, she hears the Falls of Love “playing the original of the theme song which all the little streamlets had sung far below”. Once over the edge, the waters were like winged things, alive with joy, so utterly abandoned to the ecstasy of giving themselves that she could almost have supposed that she was looking at a host of angels floating down on rainbow wings, singing with rapture as they went. As they reach the foot of the mountains, Much-Afraid meets her first big challenge. She must accept the two guides the Shepherd has chosen to help her ascent, Sorrow and Suffering. She is dismayed, but soon needs their help on the steep climb, and to escape her relations who hate the Shepherd and try to lure her back: Pride, Resentment, Bitterness, and Self-Pity. Her next lesson in trust comes when the trail leads not up to the heights, but down to a desert – not contradicting his promise, the Shepherd tells her, but only a “postponement for the best to become possible.” Much-Afraid learns the secret of Acceptance-with-Joy and starts to understand that “self-sacrifice is the ecstasy of giving the best we have to the one we love the most.” Here she builds the first of many altars to sacrifice her will for his, finding in the ashes the first of 12 memorial stones. She had the feeling that somehow, in the very far-off places, perhaps even in far-off ages, there would be a meaning found to all sorrow and an answer too fair and wonderful to be as yet understood. Perhaps my favourite lines come as Much-Afraid faces a sheer precipice that only a deer could scale. She sobs in despair until the Shepherd appears, and then bursts into laughter – for her to climb up there is so preposterously absurd! She began to realize that, cowardly though she was, there was something in her which responded with a surge of excitement to the tests and difficulties of the way better than to easier and duller circumstances… even the dizzy precipice had been more to her liking that this dreary plodding on and on. Her journey ends in a cloud-filled canyon at a final altar, the grave of her hopes, where all longing for human love will be burned away and every desire crucified but one: to simply do His will. Love is beautiful, but it is also terrible – terrible in its determination to allow nothing blemished or unworthy to remain in the beloved… Love is a consuming fire. This wraps up part one, “Weeping May Endure for a Night”. In the brief part two, “Joy Cometh in the Morning” (Psalm 30:5), Much-Afraid finds the seed of love has blossomed in her heart and receives her new name. The book concludes with the last of many lyrics inspired by Solomon’s Song of Songs. So where thou goest, I will surely go. Much-Afraid has learnt to trust and obey the Shepherd even in the darkest valleys, to be confident that in the end he always keeps his promises. 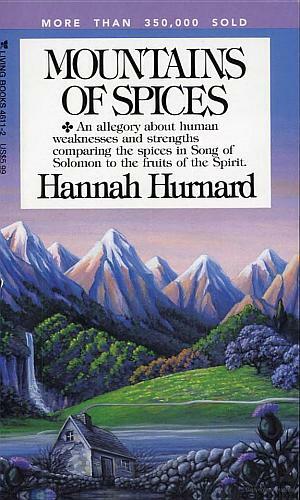 Two decades later Hurnard wrote a sequel, named from the last words of Song of Songs, Mountains of Spices (1977). For me, it’s maybe less memorable, but still moving. Here Much-Afraid – now renamed and crowned with the King’s glory – returns to the Valley of Humiliation to help rescue her former neighbours from their self-made dungeons. Mrs Dismal Forebodings, cowering alone in her cottage like the “thin, furtive-looking spiral of smoke which crept up into the air as unostentatiously as possible” from her chimney, meets the Shepherd, replaces her widow’s weeds with his glittering shawl of praise, and strides forth to aid others, for “love turned outward is true life”. It is all written in you, by you, yourself, Lord Fearing – written plainly for him to see, just as when an old tree is cut down, the whole history of its life is found written plainly in its heart and the rings formed during each separate year of its life. One who knows how to read it can understand at a glance about years when it was buffeted by the great storms and could scarcely make any growth, and those years when it was diseased, and those when it went forward and became strong. Or, if the heart has been eaten away little by little by worms and grubs, it all becomes plain when the tree falls and is found to be hollow and dead. In the odd-numbered chapters, valley-dwellers like these choose to embrace or reject both the truth about themselves, and the law on which the universe is founded: “Everything that loves, lives for ever. Everything else perishes.” In alternate chapters, the Shepherd instructs Much-Afraid in the laws of love atop the nine peaks that encircle the valley. On every summit grows one of nine spices (from Song of Songs 4:13-14), each corresponding to a fruit of the Spirit (Galatians 5:22-23), yielding, for example, the saffron of long-suffering, the frankincense of faith, and the pomegranates of love. Hurnard has a rich botanical vocabulary and a painterly delight in colours. We cross fields starred with gentians, sprinkled with buttercups and cowslips and crocuses bobbing beneath a sky of sapphire, walled by snowy ramparts that glow at dusk with flame and rose. Her wilderness vignettes remind me of New Zealand tramping trips: ambling through sunny valleys with bubbling creeks and bellbirds feeding on flax; or trudging along ridge tops in freezing mist, longing for the cosy hut. 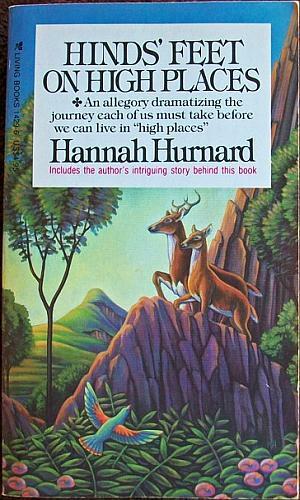 And, as did Christ, Hurnard found the natural world an endless source of parables. The pliable humility of reeds makes them unbreakable. Camphor bushes transform bitter manure into perfume – “Joy is sorrow inside out, Grief remade again.” Myrrh trees bleeding out their fragrant resin once again play Hurnard’s favourite theme, how happy it is to love and give. One must either succumb to the fearing nature altogether and become a “Craven Coward” for the rest of one’s life; or… be made at last into a radiant “Fearless Witness” to his love and power. The very characteristics and weaknesses of temperament with which we were born… can be transformed into their exact opposites and can therefore produce in us the loveliest of all qualities… Love takes our defects and deformities, and out of them… fashions princes and princesses of God. This gives me great hope. At times my path has meandered along the shores of loneliness, or down through the desert of defeat. The story of Much-Afraid helps me to trust the Shepherd’s wisdom and follow his way, even when I see only my weaknesses, and can’t understand why that way is so steep. Perhaps it is the Shepherd’s means to also transform this quivering jellyfish into a noble alpine stag! For a sermon on the Good Shepherd’s character and hearing his voice, see my previous post. 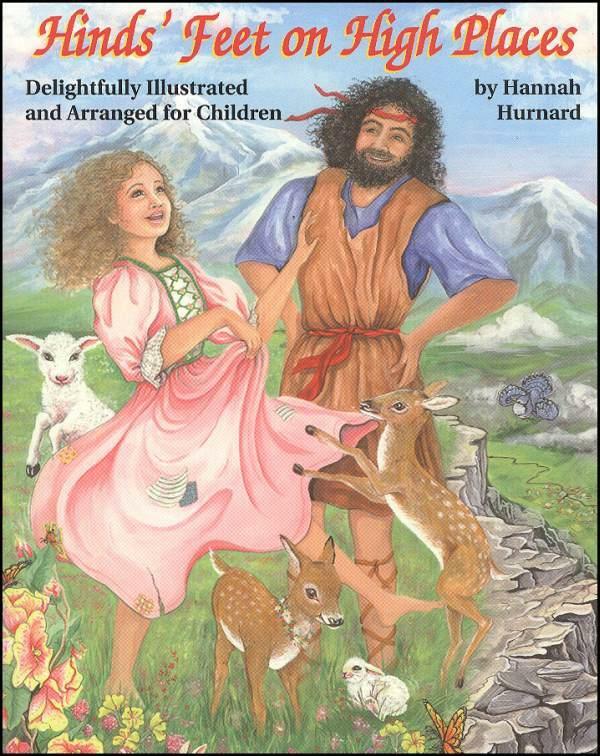 See music and art set to the audio book of Hinds’ Feet on YouTube, the illustrated children’s edition, or an online synopsis with Scripture references. For just a few dollars you can buy a printed or a downloadable version of Hinds’ Feet on Amazon. 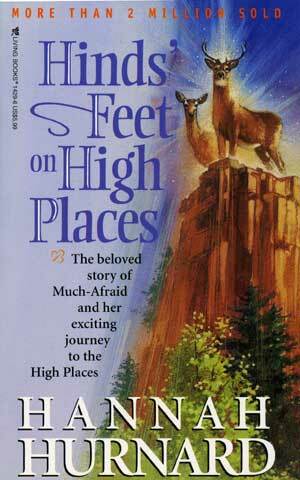 This entry was posted in Books and tagged faith, fear, Hannah Hurnard, Hinds Feet on High Places, inspiration, love, Mountains of Spices, Much-Afraid, shepherd, suffering by David Titheridge. Bookmark the permalink. Like to receive my latest posts? Just enter your email and click Follow.